Procedurally generated levels in games is always an interesting design choice. At the cost of handcrafted levels, players instead get the possibility of endless replayability. It doesn’t always pan out, however, as several games have felt disjointed, or lacking a sense of progression. That being said, Size Five Games’ latest title The Swindle is just the type of game that is enhanced tenfold by the inclusion of random levels. Players are quickly tasked with the goal of stealing a new artificial intelligence technology, codenamed the Devil’s Basilisk, from Scotland Yard. One does not just wander into Scotland Yard, however, so thieves will have to rob several different areas (starting at homes, moving onto banks) before setting foot in the world’s most prestigious police force. Each of these areas can be played repeatedly, with the goal of obtaining more money. Players will sneak their way through the game’s 2D levels, all while clobbering enemies with melee attacks, in order to collect as much money as possible. They’ll want to stay unspotted by the enemies, though, as the robotic police force will be called in once an alarm is raised. The game’s biggest money making opportunities will be found in hacking objects, and these are typically the main goal in each level. Interestingly, the game never tells the player on when to give up on a mission before heading back to their steam-powered escape vehicle. The in-game police are totally able to be dealt with, if a player is skilled enough, and it all depends on how comfortable the player is with their own abilities. A player’s greed can be his own worst enemy, however, as enemies can take out the protagonist in one hit. Every encounter might be that character’s last, and that is what makes The Swindle so constantly intense. Death isn’t heavily penalized in The Swindle, besides losing any money you may have picked up during a run, but there is a time limit of 100 days for players to steal the Devil’s Basilisk. This means that every unsuccessful run is one step closer to not completing the game during that particular playthrough. And you know what? That is fine, The Swindle is an incredibly unforgiving, difficult game that won’t be completed by most. The difficulty is similar to Spelunky, where you can still get a ton of enjoyment out of it even if you never get close to reaching the last level. The money a player collects can be spent on a variety of things in the game’s hub area in-between heists. Access to new levels can be purchased, or a variety of upgrades that completely change how the game plays. 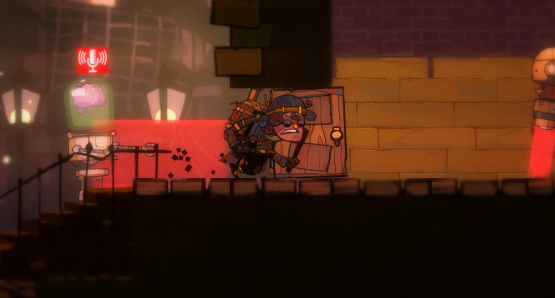 Thieves can become incredibly agile by the end of the game, as they dash through doors, and even gain the ability to quadruple jump. The craziest item is the teleporter that allows players to go through walls. As players earn more and more abilities, the levels start to open up immensely. That security door that you couldn’t open a few runs ago? Now you are able to use your hacking skills to open it up. The Swindle gets the aspect of a power fantasy right, since players go from weak thieves that are stealing from the poor to taking down banks over time. Any progression in the game is completely earned. Since there is a 100 day time limit in place, most people will end up failing it their first time playing. This is an unbelievable bummer as you lose all your progression and have to start a brand new game. That said, you can use your skills picked up from playing the game for hours and maximize your early runs. This means that on repeated playthroughs, the game progresses much more quickly. This is not thanks to any in-game bonus, but because your skill level is increasing. With players repeatedly playing the same locales over and over again, you would think that The Swindle would get boring over time. This is not the case due to its brilliant use of procedurally generated levels. Now it isn’t perfect, occasionally early on you will get some levels where you can’t even enter a building due to your limited skill-set, but the pros far outweigh the few annoying cons. Almost every level is a blast to play, and a complete thrill ride until you manage to escape or end up dead. The Swindle has all the trappings to be an addictive game. Size Five Games have created a game with an awesome sense of progression, and difficult but fair gameplay. Really, it is just plain fun to play through. Inching towards the ultimate goal feels rewarding, even if you don’t manage to make it to Scotland Yard in your first playthrough, or your hundredth. One area where The Swindle is a definite standout is in its visual style. 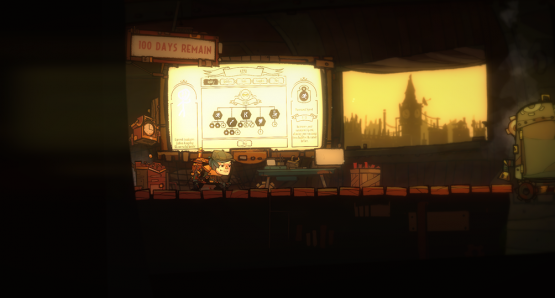 The game takes place in a gorgeous Steampunk-styled United Kingdom full of robots, and gorgeous art. The animations are also top-notch, as Size Five Games have done a great job. It is worth noting that the PlayStation 4 version of the game does look slightly better than its handheld counterpart. Most noticeably there are added effects when hacking on the console version of the game. The soundtrack found in The Swindle does a great job of heightening the tension of the stealth gameplay. Once caught by enemies, the game quickly gets much louder and makes the ensuing rush to escape an epic moment. While it may not be a soundtrack that I’ll want to listen to outside of The Swindle, it does too good of a job enhancing the game to not be commended for it. 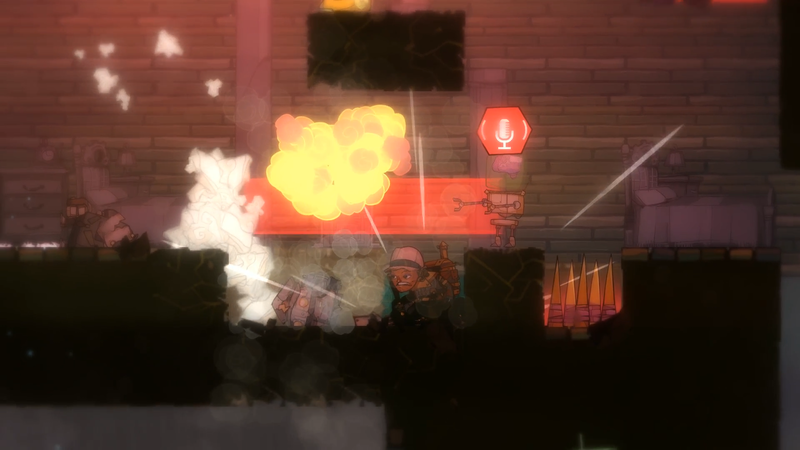 The Swindle is a game that many will end up playing for months to come. The gameplay is the perfect combination of stealth and action, and its difficulty, while brutal, is satisfying. Size Five Games, and publisher Curve Digital, have created an addictive game that needs to be played by anyone who loves a good challenge. Throw in cross-buy and cross-save compatibility, and you’ll never leave your house without The Swindle in pocket.